Michelle is a facilitator and research associate with Cognicity. Michelle brings extensive research depth to Cognicity. 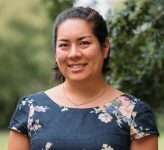 Michelle was the Research Manager for Recruit Smarter and is also an Associate Lecturer at the University of Melbourne. Michelle has presented internationally recently on CV de-identification and diversity in recruitment, Leadership essentialism, Masculine norms, domestic violence attitudes, and the role of objectification, and Engaging bystanders in sexual objectification intervention. Michelle’s research interests are closely aligned to Cognicity’s methodology and current research includes include “Born to Lead: Correlates and Consequences of Leadership Essentialism” and “How does it feel to be treated like an object? Direct and indirect effects of exposure to sexual objectification on women’s emotions in daily life”.